Head over to Amazon’s computer section right now and you’ll notice that you have quite a few choices. Thousands of them, in fact. And honing in on the one that best suits your needs can be quite a chore — especially when the data you need to make a good comparison is scattered across blogs, review sites, and electronics databases. Sparkbuy thinks there’s a better way. The site, which recently closed a $1 million funding round, has set out to build a ‘Kayak for consumer electronics’, and it’s starting with laptop computers. The gist of it: enter which criteria are important to you, and the site will give a listing of laptops that it thinks you’ll like best. Sparkbuy is entering private beta tonight, and the first 500 TechCrunch readers to enter the invite code ‘TCRUNCH-VIP’ will gain access (make sure to click the ‘Sign Up’ link on the site). At this point navigating Sparkbuy is pretty straightforward. After logging in, you’ll see a list of computers alongside the right side of the screen, and a list of different options that you can rank by importance (if you care about them at all). These include things like screen size, ‘lots of memory’, Bluetooth, and so on. And yes, there’s an option to specify that you only want to see Macs. All of these listings are currently being drawn from Amazon, so you can also include a high Amazon rating as one of your priorities. As you arrange your top priorities, Sparkbuy will refresh its list of suggestions. 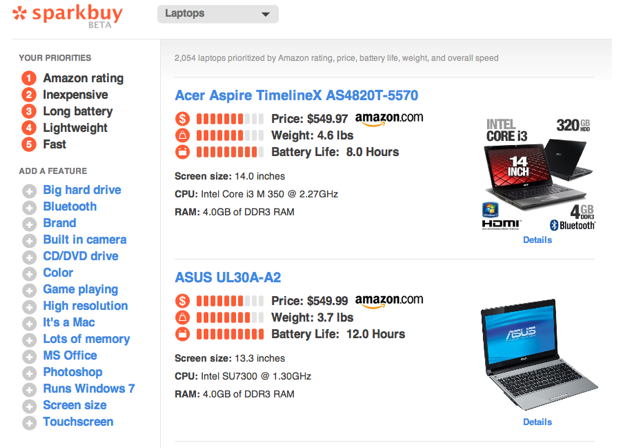 Clicking on a listing will generate a popup that gives you an at-a-glance overview of the computer’s specs. Once you’ve found a machine you like, the site will happily refer you over to Amazon to complete the purchase (Sparkbuy makes money through Amazon’s affiliate program). So what’s the secret sauce? CEO Dan Shapiro acknowledges that there are plenty of sites out there that look to help consumers pick out a computer, but he says that most of this information is scattered across various review sites and blogs. Even the electronics databases, he says, are incomplete, because they use data provided by the manufacturer. These can be misleading or worse — the manufacturer will sometimes simply not list a feature that it doesn’t have, which can lead to a blank spot in a database rather than a definite ‘no’. To fix this, Sparkbuy employs a part-time team of around 15, who have fleshed out its database of 2,000 laptops. Shapiro says that by the time the site launches to the public, its database should be 99% accurate. Sparkbuy’s flexibility seems like it will be great for tech-savvy consumers, but I question if it may be a bit too much for some people. After all, there’s a reason why Apple only sells a handful of laptop models — it’s easy to get overwhelmed when you’re choosing between a dozen laptops that differentiate themselves with features you’re only vaguely familiar with. I asked Shapiro if the site might be better if it simply named the best of each class of computer: a great ultralight for people who travel frequently; a workhorse for people who need to do video processing, and so on. But he says that while consumers tend to have a lot of overlap in terms of the features they want, there’s often one outlier — some feature that they definitely need that may not be found on your normal, baseline computer. That surprised me given how well Apple’s one-size-fits-all solutions tend to work, but if he’s right, then Sparkbuy may be on to something. Shapiro says that Sparkbuy will likely open to the public around January. And the site already has its eyes on its next target: televisions.